Although most organizations will have some form of risk management processes and procedures, these may not be structured and well thought out to be most effective. Risk advisory services help client organizations effectively identify, classify, mitigate and monitor their risks. Risk advisory services encompass areas such as Financial Risk management, Information Risk Management and Regulatory and Compliance services. Financial and Information Risk management services focus on addressing and managing a broad range of issues related to financial data and IT systems security and privacy while managing the challenges of an ever-changing business and regulatory environment. Regulatory and Compliance services help organizations manage activities in their Governance, Risk and Compliance (GRC) domains. These encompass areas such as corporate governance, enterprise risk management (ERM) and corporate compliance with applicable laws and regulations. 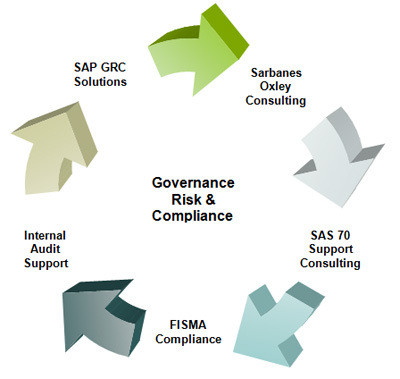 ARK Solutions helps clients manage Governance, identify Risks and ensure ongoing Compliance. We closely collaborate with our clients to help identify and mitigate business and technology risks by providing a practical, efficient and cost effective approach to managing the corporate and IT governance landscape.